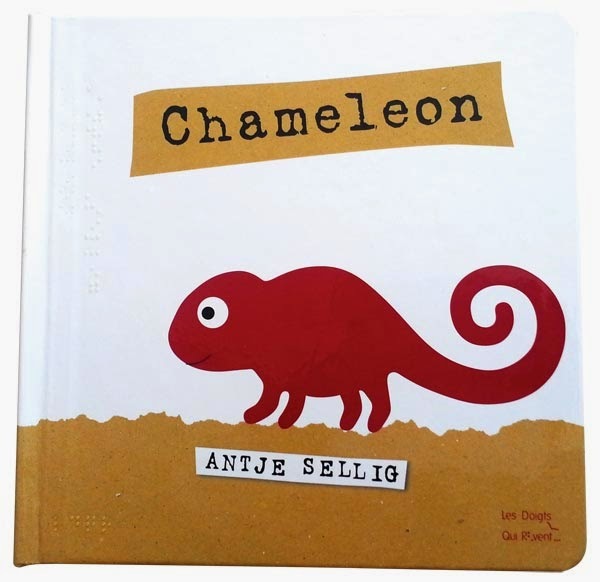 Chameleon is intended to be read aloud and shared with children with visual impairments, ages three years and up. Reading aloud can be one of the most powerful contributions adults can make to a young child’s development of literacy. Awareness of written language is developed. Sharing books in an interactive manner, talking about the text and illustrations, has been demonstrated to build vocabulary and strengthen oral language skills. For emergent print readers, pictures often act as an important bridge helping the child take a more active role in reading, as a listener and as a reader. 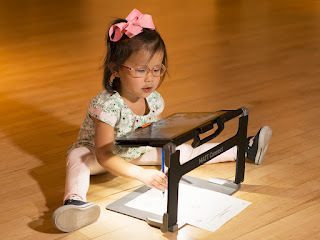 In addition, they offer critically important opportunities to build tactual discrimination and exploratory skills and to encounter spatial relationships and the conventions of 2 dimensional graphic displays. Chameleon's text is provided in large print and contracted braille. The clear, silk-screened braille is of high quality and extremely durable. Originally produced in Italian, French, and German, the English version is produced for APH by Les Doigts Qui Rêvent (LDQR) workshop in Dijon, France.